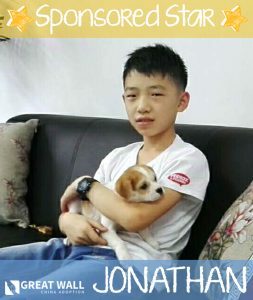 Introducing our Sponsored Star for January, Jonathan! This amazing kiddo’s name is Jonathan, and he is 13 years old! Jonathan is completely deaf in both ears, but his cognitive and mobility development are on-target. He can communicate well using writing and hand gestures and is able to write about 40 simple English words. He is very helpful to his teachers and does well very well in school! He also love sports, and is great at jump rope, ping-pong, and badminton! We are so hopeful that Jonathan will find his Forever Family soon, as he will be aging out on his 14th birthday. If you or someone you know is interested in reviewing Jonathan’s file, please reach out to GWCA’s matching specialists to learn more! As our Sponsored Star for January, Jonathan has a $2,000 grant available towards his adoption fees! If you’re interested in learning more about Jonathan, visit our photo listing or contact our matching specialists today! 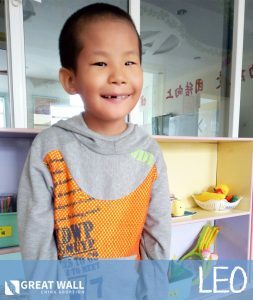 On the 1st of each month, Great Wall China Adoption will feature one of the kiddos from our Orphanage Partnerships as our monthly “Sponsored Star!” As our Sponsored Star, that child will be provided a $2,000 grant towards their adoption fees! Each of the kiddos selected will be a Special Focus child, meaning they have not found their Forever Family yet due to their age or the degree of their needs. Together, we can find loving homes for these amazing kids!